Accommodation will be available within Holland Halls of Residence on Streatham Campus located only a 5 minute walk from the Department of Physics and Astronomy. 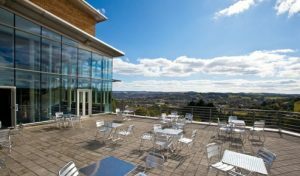 Please visit the University of Exeter Online Store to register for the ICMM2018 and book accommodation. Please note that rooms in Holland Hall will no longer be reserved for ICMM from the 3rd June. If you have not yet booked accommodation, please register and book accommodation by the 3rd of June to secure accommodation in Holland Hall. After the 3rd of June accommodation can be booked through the Event Exeter website on a first-come-first-served basis. Single occupant: £50.83 per night. Holland Hall check out is at 10 am. If you are not staying at Holland Hall on Wednesday night, we ask that you check out in advance of the 9 am morning session on Wednesday 27th June. A secure luggage storage facility will be set up in a seminar room adjacent to the speaker auditorium. Please ensure that you check out with sufficient time to stow your luggage and arrive at the morning session in a timely fashion to avoid disruption to the first speakers. If you require additional accommodation prior to the ICMM conference that is not available through the online store, e.g. Saturdat 23rd June, such bookings can be made through the Event Exeter website. If you have booked accommodation in Holland Hall for both ICMM and the workshop on Emerging Applications of SpinTransfer Torque (EASTT), we will pass on your details to ensure that you do not have to change rooms. Travel information to Streatham Campus can also be found on the The University of Exeter website. For international flights to Heathrow, the Heathrow Express high-frequency rail passenger service provides a convenient ~15 minute link to London Paddington. From London Paddington, high speed trains provide a direct rail service to Exeter St. Davids (from around 2 hours 15 mins). For international flights to Gatwick Airport, the Gatwick Express high-frequency rail passenger service provides a ~30 minute link to London Victoria. From Victoria, the London Underground Circle (yellow) or District (green) lines can be taken to London Paddington, to connecting direct rail services to Exeter St. Davids. Exeter is served by Exeter St David’s and Exeter Central Stations. Exeter St David’s provides a rail ink to Reading and London Paddington and is approximately a 15 minute walk from Streatham Campus. Exeter Central provides a rail link to London Waterloo and is a 20 minute walk from Streatham Campus. Taxis are available, see below. UK rial tickets can be purchased online and collected at the station from which you will travel (booking reference and payment card required to retrieve tickets at station). Advanced booking is advised to avoid high ticket prices of tickets purchased on the day of travel. Please check that you understand the travel restrictions of tickets purchased in advance as the cheapest tickets are usually only valid for a particular rail route and time. Apple Taxis Exeter (01392 666666) have a taxi rank on Streatham Campus, and offices at both Exeter St David’s rail station and Exeter International Airport.